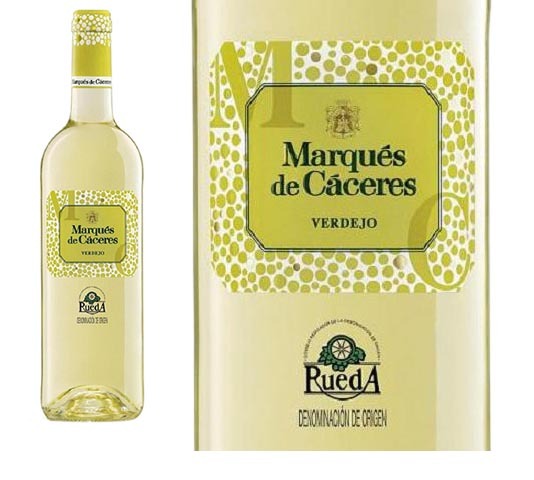 Marques de Caceres Verdejo de Rueda is an excellent, refreshing summer wine made from a rising star white grape grown in its own corner of Spain. The wine is 100 percent Verdejo, a grape that’s been used to make wine for centuries but had languished in obscurity until relatively recently. Grown almost exclusively in Rueda, an arid wine region 90 miles northwest of Madrid, Verdejo was rediscovered in the 1980s, and has grown steadily in popularity ever since. Ten years ago, it might have been hard to find a Verdejo wine, but now they are available nationwide. There are at least 32,000 acres of vineyards in Rueda, and 90 percent of them are planted in Verdejo. In 1980, the grape represented only about 50 percent, an article on Wine-Searcher.com says. Carmen Blanco, the young, innovative maker of Rueda wines at Marques de Caceres, has garnered international honors for high-end Verdejo wines. She apparently puts the same care into making Verdejo de Rueda, a wine that tastes far better than its $9 price. Enrique Forner founded Marques de Caceres in Rioja in 1970, after he returned to Spain. He had fled from the civil war more than 30 years earlier. The family’s history in the wine business stretches back to 1925. Forner learned the trade in Italy, and spent five decades making wine at his chateaux in Bordeaux. He was a pioneer in modern Rioja winemaking and a leader in introducing oak-barrel aging for the region’s top red wines. He built the company’s reputation by placing a strong emphasis on quality. The winery is still owned by the family, and Enrique’s daughter, Cristina, runs the business. She was raised in France and learned winemaking at the family’s estate there, according to the Marques de Caceres website. Marquis de Caceres bought about 300 acres of vineyards in the heart of Rueda in 2014, hired Blanco and launched a major project to make high quality Verdejo. The grape is native to Rueda, and doesn’t adapt well to other wine-growing regions, Blanco said in an interview with Curious Wines, an Irish wine blog. The soils and weather conditions in Rueda give the wine special characteristics that are hard to replicate elsewhere, she said. The vineyards run along the Duero River in a high flat plateau separated from the Atlantic Ocean by the Cantabrica mountain range. The soils are terrible for growing anything but grains and grapes. The grapes love the poor, gravelly, sandy soils of brownish gray limestone. The days are hot, which allows the grapes to ripen, and the nights are cool, giving the vines and the fruit time to refresh and retain the properties gained during the day. Winter also is extreme and spring and fall are non-existent, Blanco said during the interview. The wines in Rueda are made in a traditional way under strict regulations. Using oak chips or adding sugar are forbidden, Blanco said. The grapes are picked at night and chilled before they are crushed. The juice is fermented at a low temperature and kept on the lees (dead yeast) for stability before bottling, Blanco says in the tasting notes. The result is a bright, greenish straw-colored wine with intense clean flavors of lime, green melon, grapefruit, fennel and white peach, the notes say. Marques de Caceres Verdejo de Rueda is an excellent wine to serve cold on a hot, muggy summer night with such light dishes as smoked salmon parfait or red peppers stuffed with goat cheese. Or you can serve it with a full meal. I had it accompanying garlic shrimp on pasta and a second time with a spicy Spanish fried chicken. It was an excellent match with both meals. The wine’s flavor and versatility have made it one of my favorite summer pours, and it’s certainly affordable. I found it for $7.99, and it’s widely available throughout New England.